This month, we’ve got a little extra pep in our step — and we can’t wait to tell you all why … we’ve collaborated on an exclusive collection with Livie & Luca! 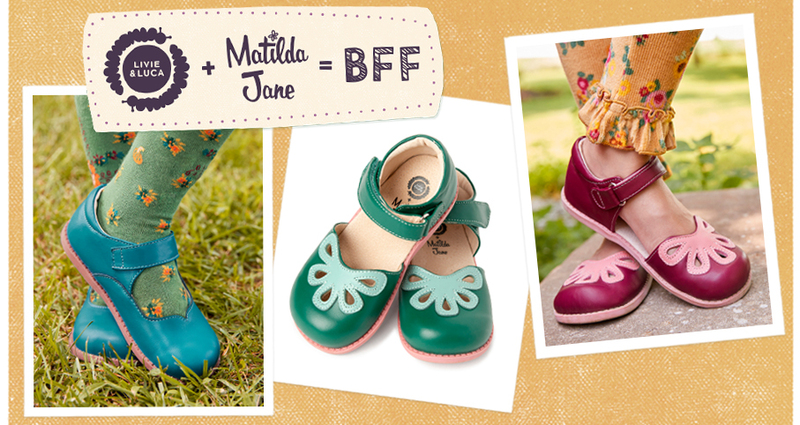 That’s right – you can now buy your (and our) favorite girls’ shoes in designs and colors exclusive to Matilda Jane! Hands down the cutest collaboration you ever did see, it all started with a real-life friendship. Our founder Denise first fell in love with Livie & Luca when she stumbled upon the classic Yellow Petal in 2012. After using the iconic mary janes in one of our photoshoots, the sweet style quickly sold out nationwide. Denise and Livie & Luca’s founder, Mitzi, met soon after. Wonderfully inspired by each other’s use of color, attention to detail, touch of whimsy, and passion to create and spread joy, the two became fast friends. A true celebration of their friendship, this new collection celebrates all the very best things about Matilda Jane and Livie & Luca, making for some pretty special shoes you can’t get anywhere else. What makes them so covetable … and collectable? 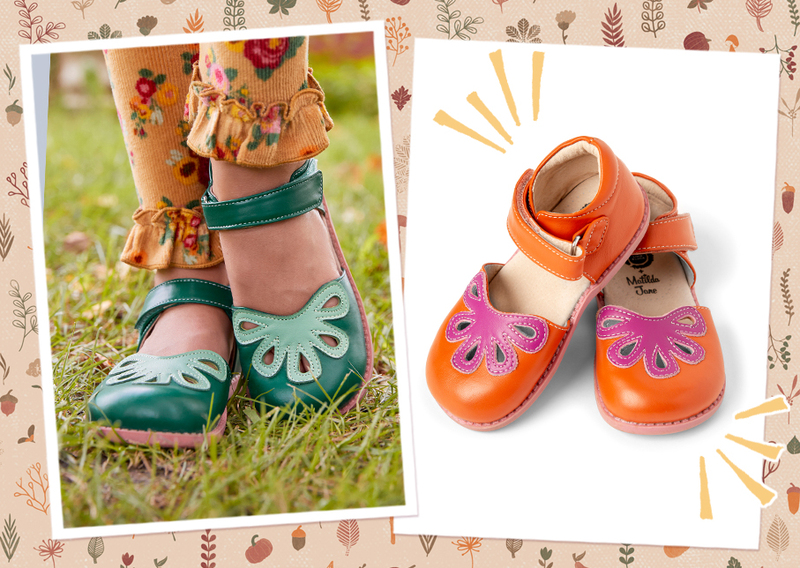 Each sweet shoe has an exclusive Matilda Jane + Livie & Luca logo on the footbed – AND an exclusive pink sole – eeek, so cute! All the shoes feature a genuine leather exterior, an adjustable hook-and-loop closure (just right for little fingers) for a perfect fit, flexible soles, and a padded heel collar for comfort, too. Our favorite part? Since these shoes were designed in collaboration with our design team and Livie & Luca, they are the perfect pretty complement to our entire Fall collection – giving your gal a complete head-to-toe look that’s bound to put a pep in her step and a little extra joy in every happy twirl! The four new Matilda Jane + Livie & Luca shoes are available now, only at matildajaneclothing.com and through your MJC Trunk Keeper. Hurry – we have a feeling these darling designs will go super fast! Catch them while you can!! Love the new Fall 2018 shoes! I love the clothes and shoes. I ordered the women’s and girls pajamas, the red shoes, harvest dress for my granddaughter! She models for trunkkeeper here. Her name is Cali!